My mom and I spent a few weeks in Shanghai this past winter, visiting family and gorging ourselves on dumplings. A lot had changed since I was last there in 2015: the skyline was denser, fusion restaurants were more popular, and there was much more law and order. But the biggest change was the technology: mobile payment was everywhere, in noodle shops, high-end boutiques, Didi (China’s “Uber”). It extended to buying a car, trading stocks, even paying panhandlers. So how did mobile payments become so ubiquitous in the most populated country in the world? It’s because in China, credit cards never gained the popularity they see elsewhere in the world and because the infrastructure for mobile payments was already in place. Most of the world was slow to adopt credit cards in the 90s, and China was already far behind in development. By the time their infrastructure had caught up, it was designed to fit in the digital era, with a mobile-first mentality. Because of China’s censorship of huge American corporations including Google, Amazon, Twitter, and Facebook, it became much easier for their own domestic companies to grow. They’ve managed to pump out huge monopolies including Baidu (Chinese Google), Alibaba (Chinese Amazon), and WeChat (Chinese Facebook + Twitter + Instagram). AliPay was initially developed to make it easier for customers to buy and sell on Alibaba, a process that was a huge barrier without credit cards. PayPal’s story was similar, as they only became successful as an alternative to sending physical checks on eBay’s platform. Over the last 15 years, mobile payments in China have grown into a $16 trillion market dominated by China’s two biggest tech giants Tencent (owner of WeChat pay with 600m users) and Alibaba (owner of AliPay with 400m users). Mobile payments in China totaled $9 trillion in 2016 while mobile payments in the US saw only $112 billion in mobile payments. In 2017, 23.1% of sales in China were processed online, making them the most digitized shoppers in the world while in the US, only 9% of sales were online. The leading companies in America are PayPal (owner of Venmo) and Apple Pay; even combined, their userbase (297m) doesn’t even touch AliPay’s platform, let alone WeChat’s. The technology that the Chinese mobile companies use is much more accessible than Apple Pay’s. Apple uses NFC (Near Field Communication) technology, which requires every vendor to purchase an NFC device in order to accept mobile payments. 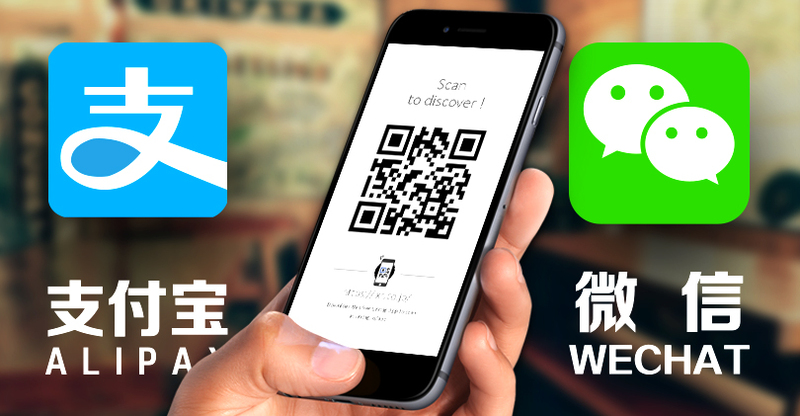 WeChat and AliPay use QR codes, which means that anyone with a phone can send and receive payments. It’s much easier for merchants to accept mobile payments when the only barrier is setting up an account. Although NFC payments are more secure because the data is better encrypted, QR codes are still safe enough and are often protected through another layer of security via a passcode. Alipay has also recently launched smile to pay, a device that is able to recognize all of its customers’ faces like Apple’s Face ID. The video shows consumers putting on wigs and heavy makeup with no luck at spoofing the device. While the technology could be revolutionary, allowing customers to go to restaurants and malls without bringing their phones or wallets, it also straddles the line between cool and creepy. With the amount of data that Alibaba and WeChat have on their customers and the extreme authority that the Chinese government exhibits on its corporations, that kind of data could be used to create a Black-Mirror-esque world where a face scan could reveal everything from a person’s name to their credit score. It is unlikely that the US market will catch on anytime soon. Although many Americans would agree that it would be nice to not carry around a wallet, there currently isn’t a need for mobile payments. Besides a few food trucks and small restaurants that only accept cash, credit and debit cards work at almost any vendor in the US. Only 12% of Americans showed a preference for using cash, as opposed to pre-mobile-payment China, where there weren’t any options other than paper money. The closest thing we have to China’s mobile payments in the US are Venmo and Apple Pay. Although Apple Pay is one of the leading mobile payment platforms, it is unlikely to become truly ubiquitous for 1 main reason – it’s exclusive to iPhone users. The most likely candidate for bringing this mobile-culture to America is Venmo. Although it only has about 23m users on its platform currently, it’s growing rapidly and has been expanding its offerings. It became popular as a method of sending payments between devices, but is now partnering with companies and websites to allow users to pay for services both online and in-store. Their recent partnership with Uber now allows users to pay for their rides and Uber Eats with their Venmo account. A completely card-free society still seems like a distant future, however, as Venmo did take a step in the opposite direction by launching the Venmo card, a debit card that allows users to make card transactions using their Venmo balance. We’re already in a new era of technology. Counterintuitively, it’ll probably take much longer for developed nations with infrastructure dating back to the industrial revolution to completely digitize, than less developed nations, who are building their systems in the digital age. It’s no longer a matter of if the world will ever be completely digitized, but rather a question of when. Loved your post! I have never been to China, but I have always wanted to go. I didn’t realize how ubiquitous mobile payments were there, but I thought you gave a good explanation as to why it was possible for that to happen in China but not the US. I use Venmo all the time and enjoy the convenience, but I generally will only use it to pay friends. Whenever I go to a store, I almost always use either cash or a credit card. Smile to pay sounds like a cool feature, but like you mentioned, it could challenge the creepy cool line. There is so much data being collected all the time, I hope we can trust the people that possess it. When I go out in China, all I need is a phone. I hardly carry my wallet or any paper money with me because I can pretty much pay for everything with either Wechat Pay or AliPay. Mobile payment definitely makes people’s lives more convenient in China. Years ago, people were worried about the safety issue of mobile payment. However, it got solved quickly. Mobile payment hurts the traditional banking industry a lot in China. Although people still deposit their money in banks, banks lost lots of transactions because of the rise of the mobile payment. Thanks for the great post! Alipay’s smile to pay definitely borders cool and creepy, and it may be repetitive with the complete access to phones. I love how China has implemented a currency system that is accessible for all users with WeChat or Alipay. This idea eliminates the need for cash or wallets, which improve efficiency since people almost never forget their phones. I wonder how open this payment system makes customers to merchants, and how companies can use the information of their customers to target them in a more personalized manner. Very interesting post, Anthony! I agree that Apple pay is restrictive because it only applies to IPhone users, but overall I do not think Apple pay is wildly popular among Apple users. I have never used Apple Pay and have never seen anyone else use it in stores. Although it is a very useful tool, and some of the population does take advantage of the convenience, there is such a large population of IPhone users, that Apple Pay definitely has had the opportunity to take off but still hasn’t. Alipay’s smile to pay function is definitely on the creepy-cool line and sounds to be very secure, since you are the only one who is able to access payment, but I personally would never feel comfortable going shopping without my phone or wallet. This easy access to payment would also be very detrimental to my bank account. It will be interesting to see if these innovations overseas will in anyway affect how we shop in America. Thanks for sharing! Great insights into a massive market! I am not nearly as familiar with payments in China as I would like to be (esp. given the $16T flow), but you provided some great details. I had no idea that the mobile payments in China was so large relative to the US market. Regarding the US market, I would argue that the Square Cash App is far better positioned to become the ubiquitous platform that we seek. In August, the Cash App surpassed Venmo in downloads and has incredible momentum from Dorsey and Square as well as glowing reviews/recommendations. Although the Cash App is still catching up to Venmo in terms of social capital for college students, I wouldn’t be surprised if it overtakes Venmo soon and never looks back!